This snap election might be a good opportunity to trade if you know which markets to trade in the first place. We've already showed you a historical overview of recent election results, so let's cut to the chase with possible market reactions to this landmark political event. I don't expect this election to be a ground-shaker. It's just my feeling. I don't expect Labour to win either. But the Tories (Conservative party) are already disappointing their electorate. The big "if", is whether UKIP gains any seats or remains totally marginal. There are two views among their voters: a) they voted for Brexit, and will continue to vote UKIP, or b) now that the UK has achieved Brexit, they don't need UKIP. The latter seems more prevalent. I expect them to gain a few seats, but not many. In my opinion, the only thing that would introduce huge volatility in the financial markets would be for UKIP to gain a significant number of seats. In the unlikely event that they were to gain balance of power status that would be truly ground-shaking, but don't hold your breath. However, a Hung Parliament is now looking like a close call. This would occur if no party wins enough seats to govern on their own, and, if that happens, the pound might plummet due to uncertainty. The UK needs a good Consumer Price Index (CPI), which measures the changes in price level of regular consumer goods and services purchased by households. As Brexit means they need to forge new trade agreements with their trading partners, this could win new business, or lose business. It is hard to say at this stage what the outcome of Brexit will be, particularly in the finance and service sectors. If they lose business, then they may be forced to keep rates low, whilst the GBP drops with the economy. On the other hand, banks tend to make more money in higher interest rate environments. So a prolonged low interest rate environment is not good for the UK's finance sector, meaning that it will make less money, which translates to less wages and less tax income for the government. I don't even think the finance experts in the cabinet of the UK Government know what to do in all honesty, because they are in a catch 22 situation with Brexit. (Catch 22 = a dilemma or difficult circumstance from which there is no escape because of mutually conflicting or dependent conditions). The Catch 22 for Brexit is maintaining low interest rates to attract new business because of the loss of existing business due to Brexit, vs. facing ever declining margins and profits in the banking sector due to such low interest rates. These conflicting circumstances may force a low interest rate environment for a long period of time in UK. Banking is difficult field in itself, however, when a banking loss is suffered, then banks need to lend more credit to regain those losses. Here's the moral dilemma: extending credit to riskier investments to make the money back quickly, which in itself can lead to bad decisions and even more losses. That's how a downward spiral can start within the banking industry, particularly for those with poor risk management functions, it's very similar to trading in that regard, and can lead to the spiral of doom. The most impacted Equities Index by the UK elections is the local bourse, being the FTSE. I expect the worst outcome to be if there is a Hung Parliament result, as it brings the most uncertainty. In such a scenario, then we must look for a possible retest of the 89EMA on the Quarterly TF at the very least, around 7335, along with the Q L4/ M L5 as final support for the uptrend to continue longer term, near 7130. I say this because we are currently in a strong bull market in Equities across the globe, so this outcome may be seen as temporary downside. Other than that, we could expect that buying on dips continues should the index drop. 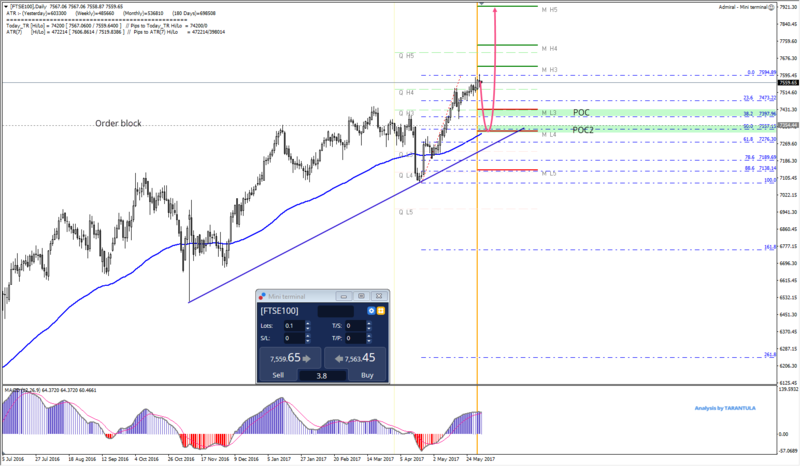 Strong POC2 zone is 7335-7355 (M L4, 50.0, EMA89, bullish order block). Shallow retracement might happen around POC1 7400-7425 (38.2, M L3, Q H3) and the pair might bounce from the zone. Targets are 7700 and 7737. If we see a Quarterly close above 7737, next is 7922. Another widely traded equities index that could be impacted is the Dax, as the UK Germany's third largest export partner. So, if anything, a Hung Parliament will be negative for the Dax, but it might only be negligible. I think it will be low to moderate downside if that is the outcome. 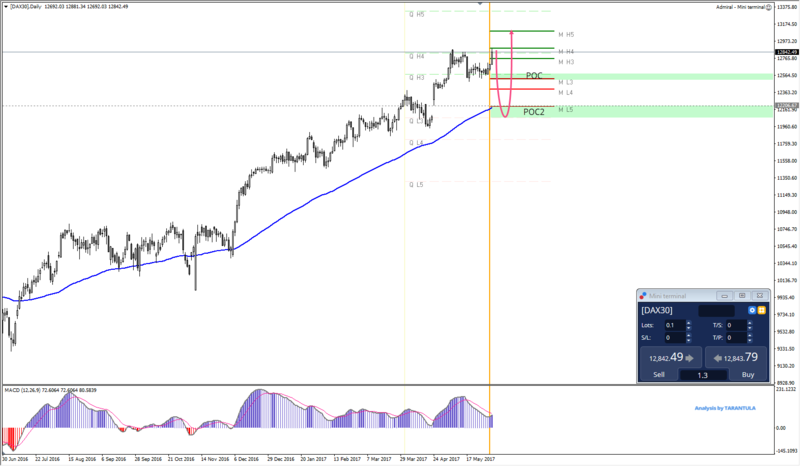 In that case we might see a pullback to the POC zone on Quarterly TF at 12520-12575 (M L3/ Q H3 which has offered support on this bull run, or eventually the POC2 (M l5, Q L3, EMA89, bullish order block) on Quarterly TF 12100-12206 and near the big round number of 12200. Breaks of those levels, and we should look at the Q L4 , which is a strong support level on the Dax historically speaking, near 11800 , all the way down to 11650. The 'snap' UK General Election should have some implications for the outcome of Brexit and the overall risk assessment including the EUR/GBP pair. In the case of this pair we need to watch both election risks and ECB rhetoric in June. According to the latest polls, the Conservatives have a lead and my opinion is that if Theresa May's wins with a big majority, it would be GBP positive and the EUR/GBP could drop. But, if the Conservatives win, but not with a big margin, the pair could drop, just to be bought afterwards on a dip. 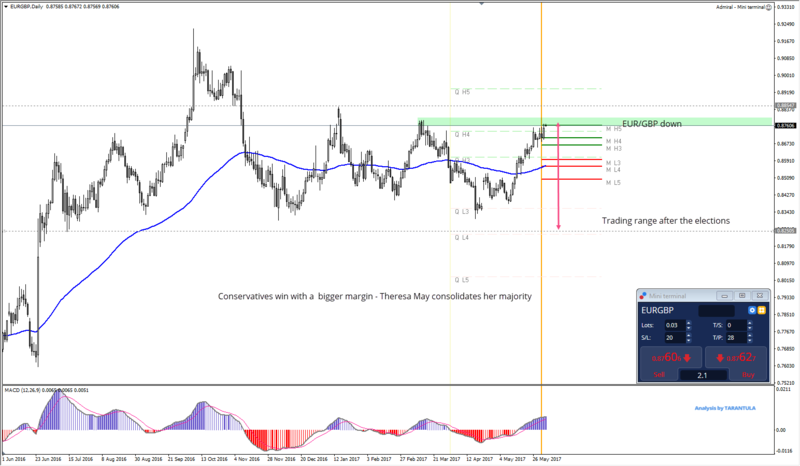 On a negative scenario that is also a possibility, where the Conservatives lose the majority and we see a Hung Parliament, then we could see a rally in the EUR/GBP. EUR/GBP goes down towards 0.8250 and then gradually grinds towards 0.8760. That could be the trading range after the elections if this scenario happens. We could see a dip targeting 0.8300-0.8360 and a gradual grind towards 0.8855. 0.8300-0.8855 could be the post election range if this scenario happens. We should see the rally towards 0.8996-0.9024 where M H5 will become a support (0.8760). Initially we should see buying on dips. Whatever the case might be with the election result, you should always keep in mind our Volatility Protection Settings tool and protect yourself against possible volatility. 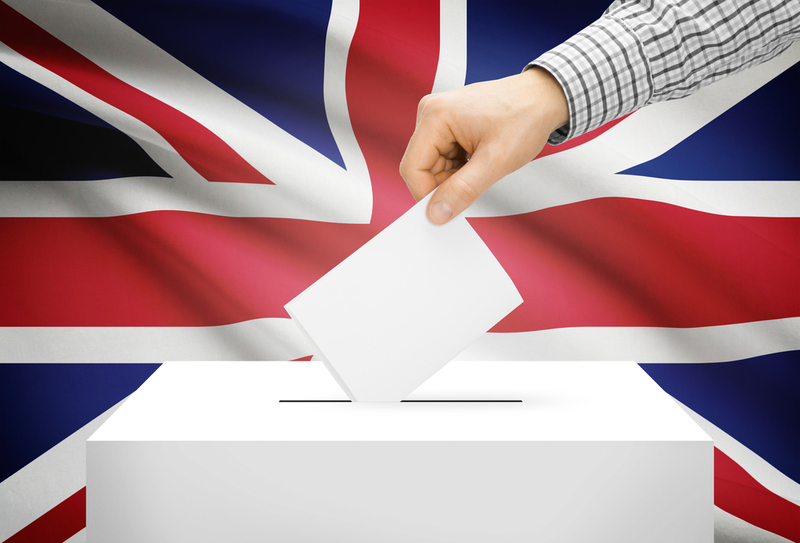 For more information about the election, live market sentiment, analysis, webinars and other articles, keep an eye on our dedicated UK General Election webpage.